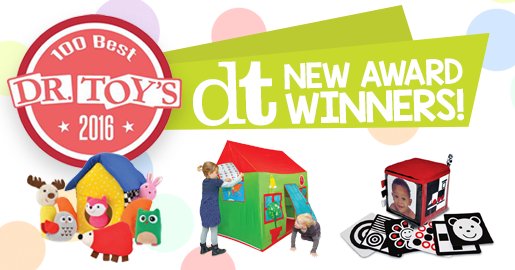 3 all NEW DT EXCLUSIVE Products awarded the “Dr.Toy’s 100 Best Toys 2016”! 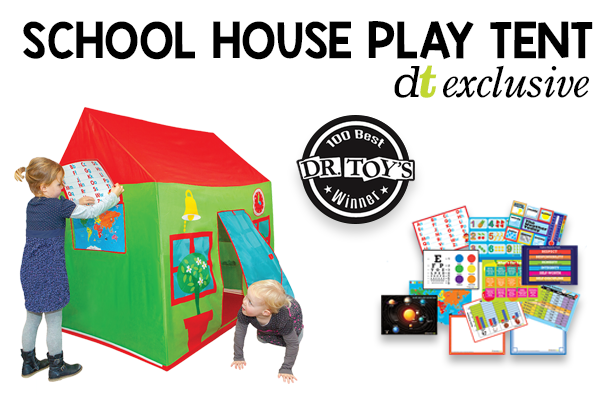 Dr. Toy has once again awarded Discovery Toys, and just in time for holiday shopping! These kid-powered award winners are gifts that run off of PURE PLAY- No batteries required! We’re honored to be recognized by such a trusted source in quality, educational toys year after year. 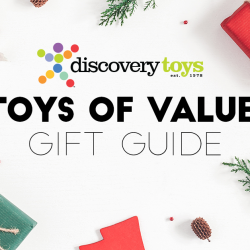 Dr.Toy has shared their top toys for over 56 years of play, toy and educational experiences with parents, teachers, and other consumers to assist them in their own selection process to match the child’s age and interests. This timely report has since 1992 features information about 100 wonderful new educational and developmentally appropriate toys, games and children’s products from large and small companies. The toys and products selected meet their high standards for design, durability, price, quality, safety, and value. Learn more about Dr. Toy here. Build baby’s visual skills with familiar faces! This colorful interactive learning cube features colors, textures and a chime sound that promote sensory stimulation, small and large motor skills, eye-hand coordination, and visual development. The 16 included high-contrast patterns and 4 photos can be inserted and interchanged in the 4 see-through pockets to kick start the learning. Start with the black & white patterns, then add the black & white & red patterns, followed by the fun faces. With the ability to add your own family photos and other images, the opportunities for learning and fun are endless. The soft cube can also be tossed and rolled to build coordination and strength. Engages baby’s visual, auditory and kinesthetic senses, building countless neuron connections during a critical formative period. Baby learns cause & effect by shaking the cube to hear the chime sound. 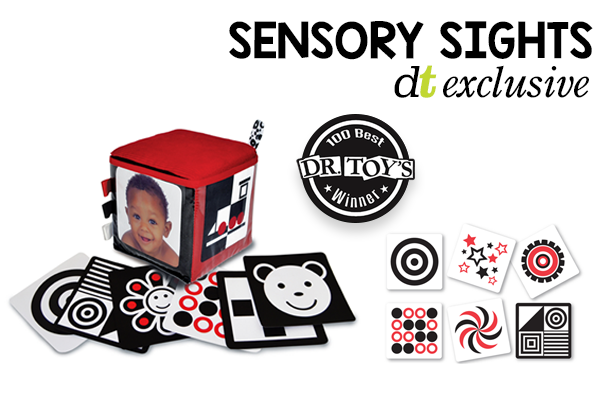 Provides progressive visual development with the high contrast black & white pattern cards, followed by the black & white & red pattern cards. Baby learns to discriminate different faces with the variety of photo cards. Baby learns to associate family photos with familiar faces in his environment. Tossing and rolling the cube builds gross motor skills and coordination. Different facial expressions in the photos can be used to teach emotions and expressions. Encourage baby to trace a pattern or face with a finger, building fine motor and early drawing skills. 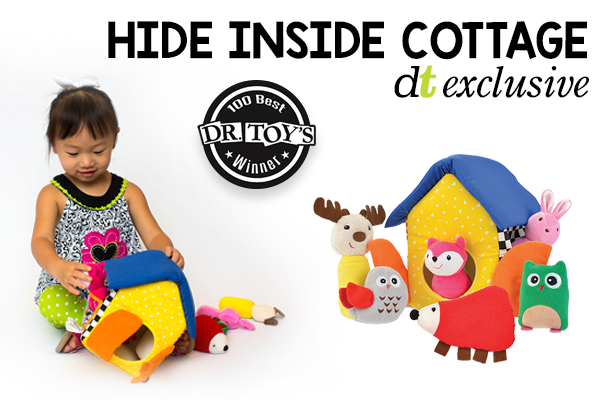 Excite little one’s senses with this soft forest-themed play house, featuring multiple places to hide for hours of stimulating peek-a-boo fun. 6 fun forest friends provide a variety of fun sounds for multi-sensory play. Insert the animals in one of the 3 side pockets. Hide them inside the cottage and dump them out. Identify them by touch. Peek one out the secret opening in one of the walls. Imagine a playful day in the forest. There’s always something new for your child to discover! 8.5” x 7” x 5.5” (21.6 x 17.8 x 14cm). Variety of shapes, sounds and textures will create more synaptic connections in a young child’s budding brain. Learn cause & effect by shaking or squeezing the different animals to produce a sound. Develop audio discrimination, identifying the different sounds. Learn object permanence through hide & seek play, understanding that an animal is still exists and is nearby even though you cannot see it. Develop tactile discrimination by identifying the animals by touch. Strengthen fine motor skills and hand-eye coordination. Develop memory recall by identifying an animal hiding in a pocket or inside the cottage. Expand vocabulary as adult helps describe the sounds, textures, appearances and names of the animals. Fosters imaginary play with a cottage play house and animal characters. Adult can help child explore story telling with the animals and forest theme. Use the secret opening in the side wall for puppet play. Enjoy your own imaginary school day, as a teacher, a student, the principal, or even the librarian! Young minds will stay engaged with the replaceable poster cards. Change up your learning center with the wipe-off sign. Easy tent-pole construction – sets up in minutes. Includes a nylon bag for convenient storage. 55 x 39.5 x 39.5 “/140 x 100 x 100 cm assembled. Develop vocabulary & language skills. Develop recall as children recreate scenes from their memory. Practice solving problems from real life scenarios. Children can develop their own conclusions. Encourages children to explore, investigate & experiment. Provides a safe haven to act out & discuss real life issues. Children can gain an understanding of life in the real world through discovery and deductive reasoning. Helps children understand the difference between fantasy & reality. Gives children control, which builds responsibility & self esteem. Helps children understand the adults in their life better. Supports the development of executive functioning skills. Children can develop their own personality. Develop verbal & non-verbal communication skills. Learn to negotiate roles and activities. Share & respect the opinions of others. Exercises the imagination & develops creative thinking. Helps children gain an understanding of school life. Learn how to tell time with a clock. Three checks off of your Holiday Shopping list! 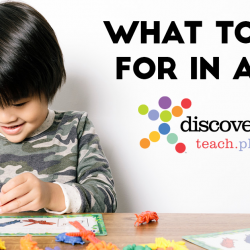 And don’t forget, we have TONS of new, DT Exclusives and kid-powered products available…Great products to encourage ALL areas of learning through PLAY! And just in time too…With Pure Play disappearing at home and school, kids are not developing 21st century skills such as collaboration, creativity, problem solving, etc. Play helps to improve communication skills, increase creativity, build cognitive skills, express emotions and promote physical development. Our award winning hands-on, child-directed play products are designed to help develop the skills necessary for Success. 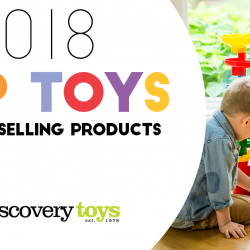 To purchase any of these AWARD WINNING PRODUCTS you can either click below, talk with your Discovery Toys Consultant, or Better yet, hold a DT Party and get these products for FREE! Now, go forth and PLAY!